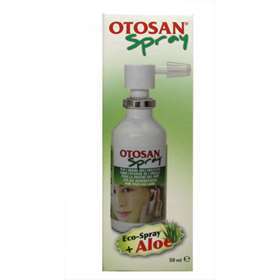 Otosan Ear spray is an isotonic solution for the elimination of excess wax and deep-down ear cleaning. With extracts of aloe, mallow, marigold, camomile and lemon from organic cultivation. Eco-friendly spray using no propellant gases. Free of colourings and preservatives. Agua, Calendula Officinalis Flower Extract, Chamomilla Recutita Flower Extract, Melaleuca Alternifolia Oil, Citrus Medica Limonum Peel Extract, Malva Sylvestris Leaf Extract, Aloe Barbadensis Leaf Extract, Sodium Chloride.